Dr. Calvin M. Johnson is Dean of the College of Veterinary Medicine at Auburn University, where he advances the college’s academic mission in instruction, research, outreach, and professional service. Dr. Johnson is a 1986 graduate (DVM) of Auburn University and in 1992 earned the PhD in pathology and biotechnology from North Carolina State University. He achieved board certification in anatomic pathology by the American College of Veterinary Pathologists (ACVP) in 1993. Dr. Johnson served on the faculty of the University of Florida for 11 years before moving to Auburn. 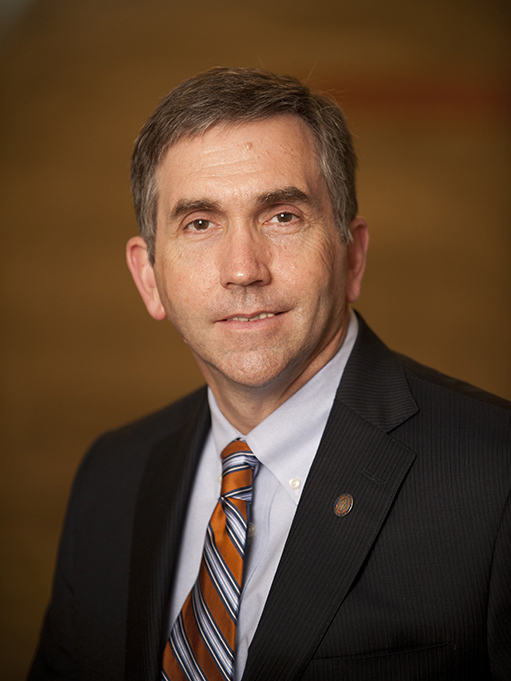 He served for six years as department head of Pathobiology and one year as acting dean before being named dean of the College of Veterinary Medicine at Auburn in 2013. Under Dr. Johnson’s leadership, the College of Veterinary Medicine educates 480 veterinary students and 95 graduate students in biomedical sciences, and supports the professional activities of 148 faculty members. In 2014, he was selected as a Distinguished Scholar and Fellow in the National Academies of Practice and as the Distinguished Alumnus from the College of Veterinary Medicine at North Carolina State University. Dr. Johnson’s laboratory investigates the pathogenesis of feline immunodeficiency virus (FIV) infection of domestic cats. FIV is a lentivirus that resembles HIV in virion structure and virus-host interaction. Members of the laboratory investigate issues relevant to pediatric HIV infection, including the influence of fetal infection on the ontogeny of the immune system, the role of the thymus in pediatric AIDS pathogenesis, and the development of novel therapeutic strategies to enhance thymus function. Clinical research interests include immunopathology, infectious diseases, and lymphoma.